I know, I'm working - for real, I am. Just need a quick break to munch on some carrot sticks and tell y'all about this cool product I read about last night while updating our Quicken stuff (evidence of my Type A half). Quicken has all kinds of different software products, but I think this one is totally cool and very useful. 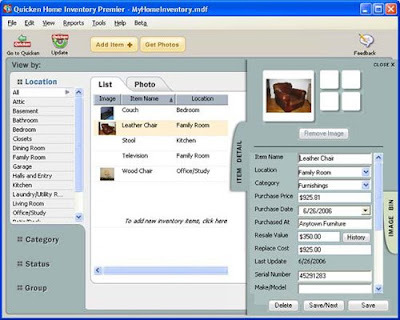 It's called Quicken Home Inventory Manager and you can download it or buy the software in store anywhere. It basically helps you create an inventory of all your belongings with photos, receipts, appraisals, etc, etc... so you have it all in the event of an emergency and for insurance purposes. And they let you back it all up on the web so you can access your info from anywhere, anytime. Taking an inventory of our stuff has been an item on our to-do list forever. (Somewhere around that one about cleaning out the basement.) One of our good friends works with a major insurance company and she's always stressed how important this is. She said if nothing else, go around your house with a video camera and capture everything you own. She said to even go in your closet and make sure to get those nicer pieces on camera and quote the price as you're taping. We really saw how vital this kind of info can be when a couple very close to us lost their home in a fire a couple of years ago. It was a total freak accident... a contractor had been to the house to do some work and left. An hour later the house was on fire. Everyone was fine - the dad was the only one home, but they lost everything. They were literally left with their lives and the clothes on their backs. Dealing with insurance was such a hassle for them. I mean nothing is easy - but y'all would not believe how they nickel and dime you! An insurance dude - an assessor I guess - that came out to the house was literally going through (what was left of) their kitchen cabinets and taking note of everything on hand. He was like "OK... bottle of soy sauce, half consumed, so that's about $0.99 to replace..." Soy sauce... are you freaking kidding me?! So if they're like that with your pantry, imagine how they are over belongings you actually care about! Thanks for sharing this with us! I want to try and get everything in my home organized. That's great. Thanks for sharing. I've got to check that out and get organized. Great tip! When we were living in Charleston, SC, we videotaped all our belongings in our apartment before we got evacuated for Hurricane Floyd back in '99!